Seen on Milwaukee’s near west side. If you were born in the last 25 years, you might not know what this sign means. The truth is, it probably doesn’t mean anything anymore. Just a relic of a bygone era. 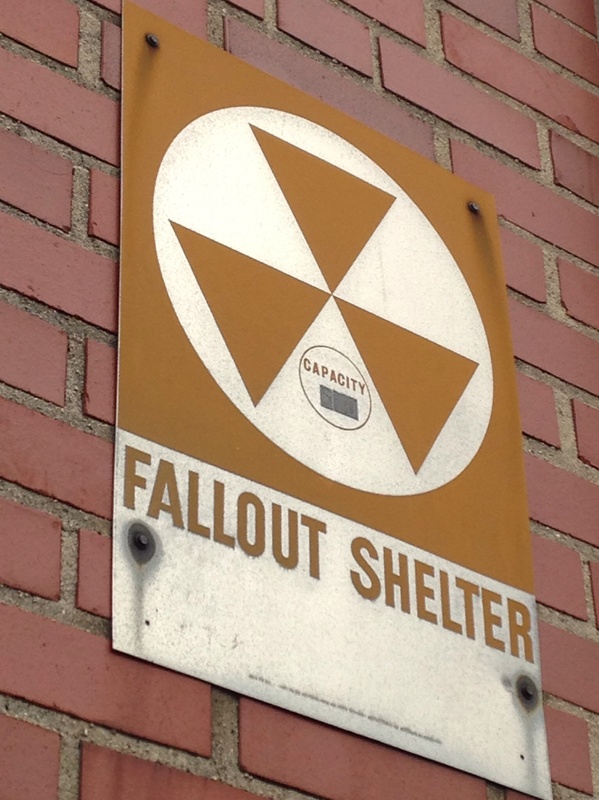 During the Cold War, one form of preparation for surviving nuclear weapons attacks was the designation of many buildings with basements as “fallout shelters” (Wikipedia article here). This sign looks pretty old, and the “capacity” number has been covered over. I somewhat doubt this building’s owner still considers it a civic obligation to shelter citizenry in the event of an atomic bomb explosion in Milwaukee. Another way America prepared for nuclear holocaust was to teach the “duck and cover” maneuver to schoolchildren across the nation. America’s preoccupation with the existential threat of “mutually assured destruction” persisted even into the 1980s. See 1983’s “The Day After,” for example, which according to Wikipedia remains the highest-rated television film in history. This movie documented the horrific ordeal awaiting those “lucky” enough to survive a nuclear attack. Or 1983’s War Games, starring Matthew Broderick, Ally Sheedy, Dabney Coleman, and a really scary computer named “Joshua” that learns an important lesson by film’s end about what constitutes the only “winning move” in the game of Global Thermonuclear War. Apparently the Cold War was still quite hot as of 1983. I came across the video below recently. If real (and I assume it is because I found it via a story on NPR), it boggles the mind that anyone would be so foolhardy as to stand “Directly Under An Exploding Nuclear Bomb,” as the NPR (National Public Radio) story’s headline reads. Our capacity for self-delusion is pretty staggering. After letting the genie out of the bottle, we remain arrogant or stupid enough to believe we can control the consequences. Which may be an inescapable aspect of the human condition. This entry was posted in History, Life, Milwaukee and tagged "The Day After", "War Games", atomic bomb, duck and cover, fallout shelter, fallout shelter sign, Global Thermonuclear War, human nature, Milwaukee. Bookmark the permalink. 2 Responses to How about a nice game of chess? I remember watching The Day After when it was first shown on TV…I was in elementary school, and it gave me nightmares. I worried a lot about “the bomb” as a kid in the 1980s! It was very scary stuff, especially for a little kid to deal with! And then all that particular dread just . . . ended. At least the public conversation. I guess we can only hold one existential threat at the forefront of our consciousness at a time.